Detergent effect: degreaser additives contribute to the separation of attached dirt and mosquitoes/beetles. BladeCleaning system is comprised by a fixed installation of pipes on each turbine's tower and a mobile equipment that feeds them. This mobile equipment is composed by a 17-20 cubic meter water tank (depending on the wind farm needs) that is pulled by a tractor to grant access to every turbine. A tank-truck can also be used if longer distances are to be made. The corporate image of the wind farm owner/contractor can be applied to the tank. A water piston-pump is mounted on the chassis of the tank and is powered by the tractor gearbox reaching up to 50 bar with variable flow. This flexibility is the key to be able to operate the system on a wide range of wind conditions. This is achieved by regulating a knob in the pump and the tractor engine rpm. 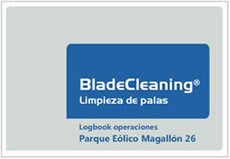 A logbook is designed for every installation to keep track of cleaning operations. 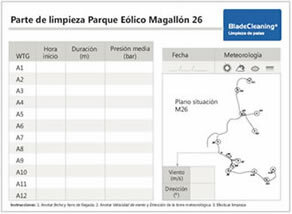 It includes a map of the wind farm so the operator can plan the operation and maintain a record of meteorological data, duration of each cleaning and water pressure used. These data can be very useful for later detailed study of the cleaning implications.